Further help and support can be found at the following sources. Changes to the software modules (released as service packs and hotfixes) are documented in log files. Please check the log files first. Log files can be found via SSD/TEDDY ‣ Help ‣ Log Files. Inside SOFiCAD you will find the Log Files via the quickstart button. Visit the SOFiSTiK website to subscribe to RSS feeds with the latest updates! If you still cannot solve an issues with the software you may generate a support request and ask for our assistance. To do so you have several options. Our support service is related to the latest program versions only. Please check your current version. 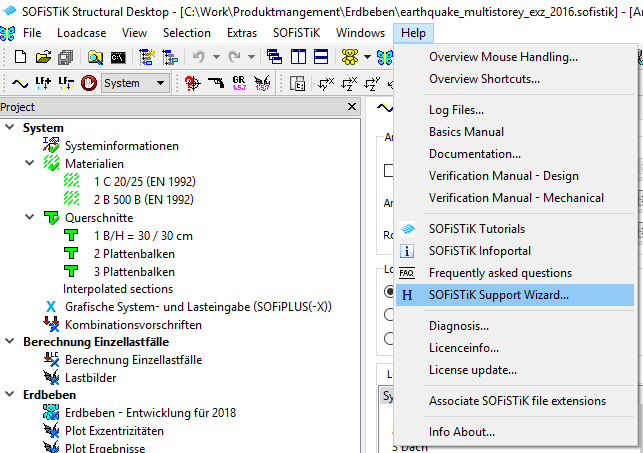 The SOFiSTiK Support Wizard helps you to collect all relevant information and sends an automatic generated E-Mail. The Wizard can be found in SSD/TEDDY ‣ Help ‣ SOFiSTiK Support Wizard. Inside SOFiPLUS and SOFiCAD you will find the Log Files via the Quick Access Toolbar. 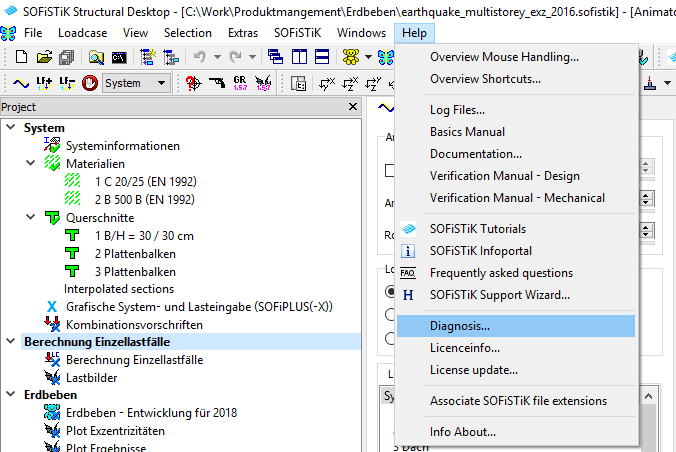 Please send your support request to support@sofistik.de, provide us with all information you can get and try to describe your problem as precise as possible. Creating a support ticket you will ask someone with no project knowledge for help. Please describe your request in a way it can be reproduced very easy. All necessary information is listed below. Provide us with the relevant data files. Delete everything inside the data files which is not necessary to understand and reproduce your request. Focus your problem only on one single obeject. In case of questions related the results of our FEA products, please send us your output as PDF file with your comments and expectations. Do you have the problem on your computer only, or on every computer? Do you have a local or a network CODEMETER license? Do you use the lastest SOFiSTiK Programm Version? Please check either with SONAR or Visit the Autodesk Exchange Apps website to check out the latest update! Attach this file to your support request E-Mail. Using the Support Wizard, this file will be generated automatically.